A collection of images we collected about funeral 'L' cars and public transit and life's end. This was once a normal passenger car. The railroad company added a special door for the corpse, painted the outside black, and BAM! Funeral car. A funeral car at Laramie Yard. 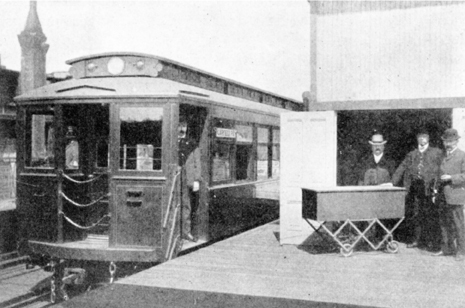 A funeral car at the Laflin station of The Metropolitan West Side Elevated, a predecessor to the CTA. Taken in 1905. 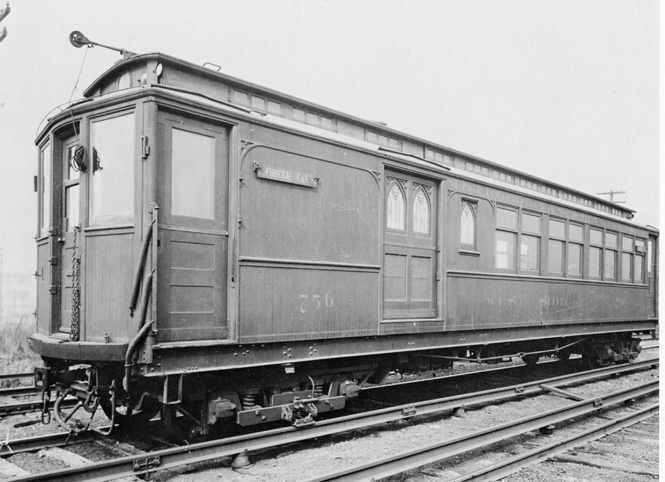 What’s the history behind the “L” funeral train cars, and which cemeteries did they go to? Stephen Libbin of Highland Park says he asked this question out of a basic love of trains and their history. He’s a lifelong railfan, and at age 70, he’s got a model train set in his basement. 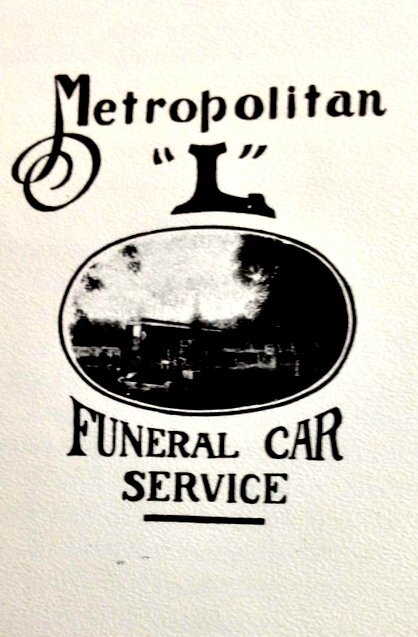 He recently read a book about the “L” that mentioned funeral cars, and he wanted to know more. So he called us. Fair enough. But lots of other people were interested too. We put this up for a vote, against questions about training for Zamboni drivers and definitions for hipsters, and this — the most macabre choice — won by a landslide. That’s probably because to most of us, the question itself presents kind of a mystery: The idea of riding the “L” to your funeral sounds surreal. To get at that mystery, the biggest clue is this: We’re talking about a hundred-some years ago. At that point, mass transit was a cool, ultra-modern luxury. Think: Your iPhone. It connects you to everything, allows you to be everywhere at once, if not instantly, pretty darned close. The technology’s basic function is connection, and in almost any situation, there’s an app for that. Which pretty much describes trains — especially the “L” and streetcars — a hundred years ago. The roads sucked, and practically nobody used them. Owning a horse — never mind a car — was kind of like owning a jet. The “L” — and streetcars, and other urban trains — made it possible to get from here to there without literally taking all day to do it. And it was a huge business. Which is the other thing about the train as iPhone: We think of mass transit as a public utility, run and supported by the government, but back then, trains of all kinds constituted a high-tech industry that made every other business work. So the train operators were competitors looking to make a buck any way they could by offering something the other guy didn&apos;t.
So, funerals? Yeah, there&apos;s an app for that. Or, there was. Before I deliver the nitty-gritty about the funeral cars themselves, though, you should know about the role trains played in the development of the city’s neighborhoods and suburbs. According to historian Ann Durkin Keating, the best way to describe that role would be: Central. Huge. As the co-editor of the Encyclopedia of Chicago, Durkin edited close to 300 entries on Chicago neighborhoods and surrounding suburbs, and she noticed a pattern in how these places got developed: Trains. (That observation became the topic of her next book, Chicagoland: City and Suburbs in the Railroad Age.) “Most of our neighborhoods and suburbs really go back to a rail stop,” she says. And so did a lot of cemeteries. As the city got bigger, and land in the neighborhoods where a lot of people lived got harder to come by, cemeteries got pushed farther out. And that meant you needed a train to get to them. And not just for funerals. Back in the day, going to visit the graves of your loved ones who had passed was a regular thing, especially on holidays like Decoration Day (now called Memorial Day). And so, cemeteries had their own railway stations. Which is kind of cool. And they had amenities. The railroad stop at Mt. Carmel Cemetery in the western suburbs, for example, actually had a restaurant built in. At Calvary Cemetery, which sits along the lakefront just north of Howard Street between Chicago and Evanston, the Chicago and Northwestern Railroad built a special elevator to lower caskets down from the platform. Railfans also showed us diagrams from when the company added flush toilets to that station, around the turn of the 20th century. So, the novelty about funeral cars wasn’t riding a train to the funeral. That’s just how people — living and dead — got to the cemetery; mourners rode in coaches, while the corpse hitched a ride in a baggage car. The big innovation, and what relates directly to our question, was the design of special cars that had room for both mourners and the deceased to ride in style. The innovator here was the Metropolitan West Side Elevated Railway, which survives today as the Blue Line. In 1905 the company put out a brochure offering this new service to Concordia and Waldheim cemeteries in the western suburbs. As the language here suggests, this kind of elegance didn’t come cheap. It cost 30 bucks, which translates to almost $700 in today’s dollars, according to the Bureau of Labor Statistics. The next year, a neighboring competitor — the Aurora Chicago and Elgin Railway — created a copycat service to nearby Mt. Carmel Cemetery. And then the two companies actually teamed up, sharing cars and equipment. Eventually, they had four or more cars running. I mean, this was a hit. Local railroad historian Bruce Moffat says that by 1907 the two companies were serving an average of 22 funerals a week. That’s just over 1,200 funerals a year. By the 1930s, things had changed. Henry Ford’s Model T made cars more affordable, roads got better, and even if the mourners were going to ride a train to the cemetery, they could put the body in a hearse. Funeral cars had just 28 gigs in 1932, and just 11 the following year. The last funeral car ran in 1934. Railroad history, preserved: Lovingly — but not quite perfectly. Now, there’s a question of how we can possibly know all this, and it’s thanks to Bruce Moffat and his brethren, the railfans. They keep these unbelievably detailed and loving archives of how the railroads used to be, including all kinds of original artifacts and records from the files of the railway companies themselves. It’s like: Imagine if in a hundred years, we’re all communicating by telepathy, but a few people like remembering how people lived back in the early 21st century, when we carried these iPhone things in our pockets — and there’s this band of people keeping meticulous files, with copies of the users guide from the first iPhone, and photographs from the opening day of the store at North and Clybourn in Chicago, and archived blog posts showing how the very first version of Angry Birds might have differed from what came later. And that describes railfans who keep these wonderfully obsessive records of everything they can find about the history of railroads. It reminds me a little of medieval monks who preserved the remnants of Western Civilization, copying out scripture and Aristotle and whatever fell to them to preserve, for a thousand years. And each order had its own very specific archive that it maintained. And some things did get lost. So, for instance, when I took this assignment, I got interested in what looks like it used to be a rail stop at Graceland Cemetery, along the “L.” Just north of Montrose, you can see some tracks that look like they used to go there, and they just end. I showed it to my son — he’s four, he loves trains — and told him I was going to find out what happened to the tracks. He loved the idea. But I never did find out. And he said he really didn’t know. Not his area. Literally. And they can. And they do. You have to look at Logan’s video here, to appreciate what goes on. They showed us all these artifacts of the rail stops at Calvary Cemetery and Rose Hill Cemetery — including maps that no one had touched for a hundred years — and they made us the gift of a timetable from the 1950s, showing that even as late as the 1950s, the train was still stopping at Rose Hill Cemetery, and Calvary Cemetery, and Culyer Cemetery. They didn’t stop until 1959. And they said they really didn’t know. Just not their area. Literally. Turns out, what’s now the Red Line was a different railroad. There is a separate society that tracks the line it was on, but nobody there seems to have taken this question up. So, Stephen Libbin, I hope we’ve answered your question about the funeral cars on the “L” trains. But, to my four year-old: I’m sorry, son. I came up empty. Correction: This story originally misstated how much a funeral car would cost in today&apos;s (2013) dollars. The correct figure amounts to nearly $700.